Parliamentarians and journalists from India and Pakistan today called for the resolution of all issues through a ‘’composite and meaningful dialogue at all levels’’ between the two countries. Akram Durrani, centre, Chief Minister of Pakistan's frontier province, receives members of the Indian peace delegation for lunch on Tuesday in Islamabad. 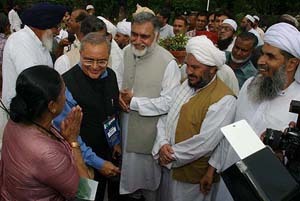 A delegation of Indian parliamentarians and journalists arrived in Pakistan for the two-day peace conference. A growing number of American IT professionals are resenting having to train Indians and other foreigners as the students end up replacing the experts who have to then contend with lower pay packets or no jobs at all. At least two Israelis were killed and 12 injured in two suicide attacks today. The wife of one of the accused in the Kanishka bombing case has said she will not pay his legal bills from a home that is in her name. Raminder Kaur Malik, 52, told the Supreme Court of British Columbia that it has been her position since her husband Ripudaman Singh Malik’s arrest in October, 2000, that she should protect her interests and those of her two teenaged children. In yet another attack on people of Indian origin in South Africa, a farming couple was murdered in the driveway of their home today while they were preparing to take their goods to a nearby market. Pakistan boosted its military presence along its western border with Afghanistan today, a day after allied US forces accidentally killed two Pakistani troops in the latest in a series of tension-raising border skirmishes. At the conclusion of the two-day South Asian Free Media Association (SAFMA) conference here, delegates from both countries found a ‘’serious fault’’ in the general practice of attempting conflict resolution through summit-level talks. They agreed to expedite the dialogue process at the state level and among people and approach all requisites for confidence building, conflict management and conflict resolution through an ‘’integrated, uninterruptible, result-oriented and structured process’’. Pakistan Foreign Minister Khurshid Mehmud Kasuri, who was presiding over the concluding session, welcomed the declaration. The delegates said while these issues needed to be addressed on a priority basis, no purpose would be served by ignoring possibilities of cooperation in various fields. The conference also agreed on the need for creating maximum space for people of the two countries to recognise and respect each other and strive jointly for guaranteeing a better future for the coming generations. The delegates called for the removal of all unreasonable restrictions on travel between the two countries and urged politicians to give priority to mobilise their ranks for peace and good neighbourly relations. The conference took note of the SAFMA protocol: free movement of mediapersons and media products across the South Asian region. Scott Kirwin clung to his computer programming job, but it was tough for him to relish his final assignment: training a group of workers from India who would replace him within a year. Laid off from a large investment bank in April, Kirwin, 36, sent out 225 resumes before landing a temporary position without benefits at a smaller bank and swallowing a 20 per cent pay cut. Kirwin is among a growing number of American technology workers training their foreign replacements in an assignment many say they assume unwittingly or reluctantly, simply to stay on the job longer or secure a meagre severance package, the Washington Times reports from San Jose California. Their plight can be seen as an unintended consequence of the nation’s non-immigrant visa programme — particularly the L-1 classification. Kevin Sherman, 47, held on to his $ 62,000-per-year contract job while he taught several dozen Indian workers how to build and maintain computer databases in 1999 and 2000. He quit rather than take on his next assignment: repairing the newly trained foreigners’ personal computers. He has been unemployed for two years, the Washington Times article said. However, Nancy Matijasich, Manifest president and chief executive, said she no longer employs L-1 workers like those Sherman has trained, because the threat of the year 2000 bug has passed and the company has less need for programmers. The State Department issued 28,098 L-1 visas from October to March, the first half of fiscal 2003. That is an increase of nearly 7 per cent from the same period in 2002. But the number of L-1 workers in the USA is likely much higher, said Charlie Oppenheim, the State Department’s chief of immigrant visa control. Each L-1 lets a worker enter the USA multiple times over several years. A Palestinian suicide bomber blew himself up in a grocery store in central Israel killing at least one person and injuring several others in the morning. 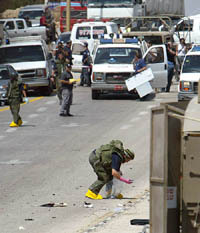 In another attack an hour later, at least one Israeli was killed and two injured in the West Bank town of Ariel. Hamas had vowed to take revenge for the death of its two militants during the weekend in Israeli operations. Israel has asserted that it would carry out operations to prevent the ‘’tickling bombs’’ despite the declaration of ceasefire by Palestinian factions. Ripudaman, a millionaire businessman, who has received an undisclosed amount from the Attorney-General’s Ministry to fund his defence team, is seeking more financial aid. Ms Malik said she’s worked six days a week since she and her husband came to Canada in 1974. The couple then established what would become a multimillion-dollar joint real estate and business empire whose net worth dwindled to # 11.6 million by December, 2002, she told the court yesterday. “I believe it is my right to protect what I’ve got for my old age and my children who are underage still,” she was quoted as saying in the Vancouver Sun daily. The court is currently conducting a hearing to determine whether taxpayers should continue to foot the bill for Malik’s Ripudaman’s team of six lawyers in one of Canada’s most expensive trials that began in April and resumed on September 8 after a summer recess. While Ms Malik said she could not afford to pay her husband’s defence from the home she has title to, she agreed with government lawyer John Waddell that she would share in any joint business losses and in her husband’s good fortune if he had won a lottery. “Fortunes are usually shared,” she said. She said she decided in 1990 that the family home in Vancouver’s upscale Shaughnessy neighbourhood should be in her name after her husband started spending money on charitable donations. However, her husband’s donations were a benefit to his wife because she received the tax benefits, the court heard. Sunny Moodley, 55, and his wife Janaki, 50, were confronted in the driveway of their home, in Inanda, by armed men and shot dead. “The Moodleys are the latest victims of violent crime in the area over the past few years,” said Ravi Govender, a neighbour and chairman of the local Farm Watch Committee. “Several other farmers have also been killed. Hijackings and robberies are rife. Recently, 11 families were attacked and robbed in one single day”, he added. The Moodleys died at the scene, he said adding the killers had not taken anything from the house and the motive behind the murder was not known. “The Moodleys had been pioneer market gardeners like many other Indian families here and they had lived in Inanda all their lives”, Govender said.